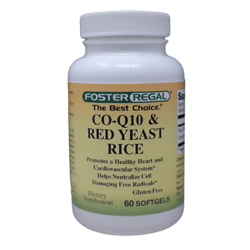 Coenzyme Q10 (CoQ10) supports a healthy cardiovascular system and immune system function due to its powerful antioxidant properties. * CoQ10 is a fat-soluble, vitamin-like compound necessary for energy production at the cellular level. Other ingredients: Canola oil, gelatin, vegetable glycerin, soy lecithin, natural caramel color. Directions: As a dietary supplement, take two (2) softgels daily, preferably with a meal. Warning: Not intended for use by pregnant or nursing women. If you are taking any medications, consult your doctor before use. Avoid this product if you have liver disease. Discontinue use and consult your doctor if any adverse reactions occur including muscle pain or weakness, rash or gastrointestinal discomfort. Not intended for use by persons under the age of 18.